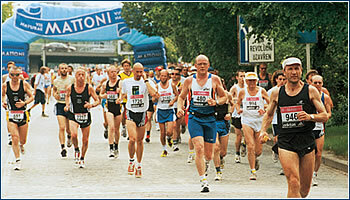 Entering a marathon offers the perfect circumstances to test our will and discover and exceed our perceived limits. In addition, successfully completing a marathon is an example of effective goal-setting, which we can apply in both our home and work life. Crossing the finish is just the start. YOU MAY BE THINKING: That’s great, if you can run a marathon. But that’s what you need to know: you can run a marathon. Almost anyone reading this can run, fast-walk, shuffle, strut, or trot the necessary miles. Even if you are not lean, fast, or even fit – if you can pass a medical check-up, you can participate. Training for a marathon can be as rewarding as the actual race. Not only does the physical preparation required boost muscle and metabolism, but it also tones internally. Regular physical exercise strengthens heart and lungs, increases your HDL (good) cholesterol, and reduces stress and blood pressure. Author of The Everything Running Book, Art Liberman, explains that there are two different ways of approaching a marathon: outcome goal setting and process goal setting. We use outcome goal setting when we are more concerned with results than how they were achieved. Though this is common way of approaching tasks, it does not work well for larger, long-term goals. Too many external factors may interfere. For example, pretend there is a particular opponent you are determined to outrun. You may train hard and surpass their speed during training, but be slowed by flu or other injury on race day. This would certainly interrupt your “outcome” goal of beating your competition. In contrast, “process” goals lead to more satisfaction and greater confidence. This relaxed way of approaching challenge involves focusing on what we can control (nutrition, hydration, training schedule, wardrobe) and performing according to our highest standards. “Process” focus is very rewarding. With this system, our confidence is determined by our willpower instead of random events and others’ expectations. Since much marathon training is psychological, it is an ideal opportunity to exercise this outlook. Before snail-mail, e-mail, fax and Fed Ex, news was either carried by foot or forgotten. Legend has it that this personal-post gave us the first marathon. Around BC 490, a Greek warrior named Phidippides ran from Marathon to Athens to deliver news of a great victory: the Athenians had defeated the Persians at the Battle of Marathon. Like most modern marathons, Phidippides’ journey was about 26 miles. In contrast, he did not receive a commemorative T-shirt. Before you hit the track, here’s some wise advice to help you pass the finish line without passing out. Four-time Olympic Marathon trials qualifier, Budd Coates, advises that those with no running experience should begin training with eight straight days of walking: The first four days consisting with a 20-minute fast walk, then the next four days with 30. Coates also suggest using the “talk-test” to determine your level of exertion. You should have enough air to speak as you run or walk, otherwise, you may be overdoing it. Author of Marathon-The Ultimate Training Guide, Hal Higdon, says that one of the secrets to running farther is to run slower. The American College of Sports Medicine recommends drinking five to 12 ounces of fluids (preferably water) every 15 to 20 minutes during a marathon. Also practice proper hydration during training. Coach/author Art Liberman advises eating something directly after the race. Research indicates that to avoid muscle fatigue the next day, carbohydrates should be eaten as soon as possible following long duration exercise.